Writer-director Matthew Vaughn and screenwriter Jane Goldman re-team for this entertaining follow-up to their 2014 spy thriller pastiche. Kitted out with an all-star ensemble, the film dishes up the same blend of super-stylish action and likeable characters that made the first film such a smash hit, but it can't quite sustain its 141-minute running time, coming perilously close to outstaying its welcome. 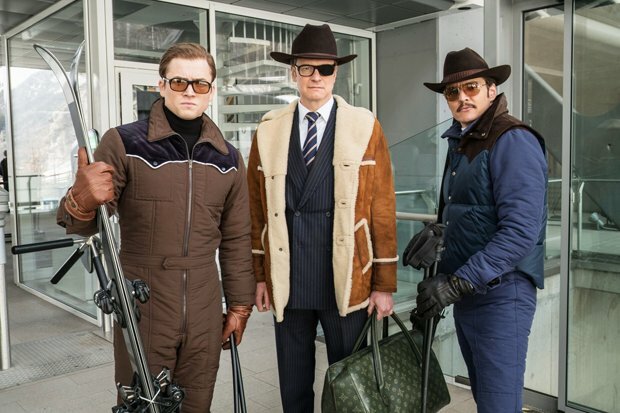 This time round, the plot involves street-kid-turned-superspy Eggsy (Taron Egerton) and Kingsman gadget man Merlin (Mark Strong) teaming up with their US equivalents the Statesmen (including Jeff Bridges as Champagne, Channing Tatum as Tequila and Halle Berry as Ginger Ale) to foil a sinister plot by Golden Circle drug baroness Poppy (Julianne Moore). Along the way, they are joined by Eggsy's former mentor Harry Hart (Colin Firth) who, in a shock to precisely no-one, turns out to have survived the first film. As with its predecessor, the key strength of the sequel lies in its commitment to preposterous comic book shenanigans, both in terms of plot and set-pieces. To that end, Vaughn sets out his stall early with a thrilling taxi chase that involves a robotic arm and a series of stunts that defy all conceivable laws of physics, including gravity, while he does his best to up the ante action-wise, most notably in a call-back bar fight that adds a cracking electro-whip to the mix. The performances are a lot of fun (Moore's especially), though Tatum is sorely underused and there's a strong sense of place-setting for a third movie, particularly with Berry's character. Surprisingly, the winner in the guest-star department turns out to be none other than Elton John, whose amusing running joke has a terrific pay-off. As sequels go, it's fair to say that The Golden Circle lacks the novelty of the first film and doesn't have quite as much in the way of charm, but there's enough here to ensure that fans won't be disappointed. General release from Wed 20 Sep.
After the Kingsman HQ is destroyed, street kid-turned-superspy Eggsy (Egerton) and gadget man Merlin (Strong) team up with their US equivalents to defeat drug baroness Poppy (Moore). Vaughan and Goldman turn up the preposterous comic book shenanigans at the expense of charm and basic plausibility, but fans will like it.